As the week comes to an end, it’s time for us to start slowing down, find a comfy spot and dream away with some beautiful interiors. This week I am sharing some new and fresh interior design ideas and most of the pictures share important sources such as paint colors, furniture, decor, lighting and other details that can help you get the same look right in your home. 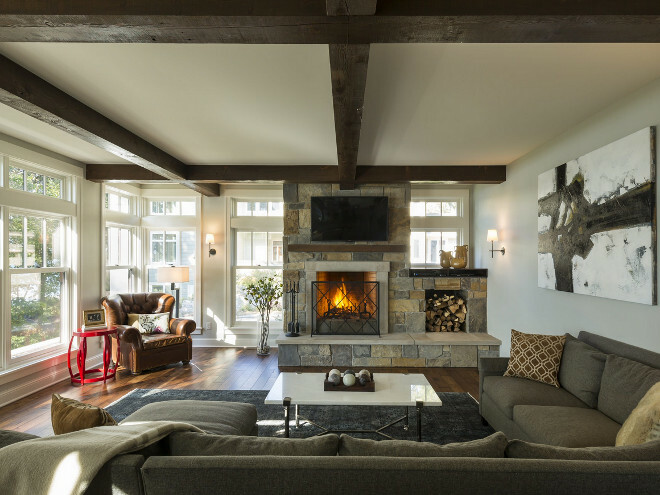 I hope these interior design ideas relax you as much as they inspire you. Have a good time, my friends! 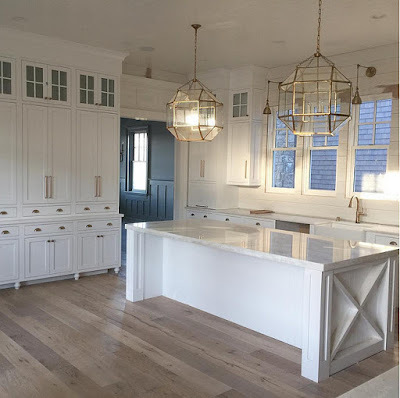 Kitchen island with thin legs. Urban Grace Interiors. The brass lanterns above the island are Urban Electric Company Hamilton. Lanterns: Urban Electric Company Hamilton –from $3,780 each. 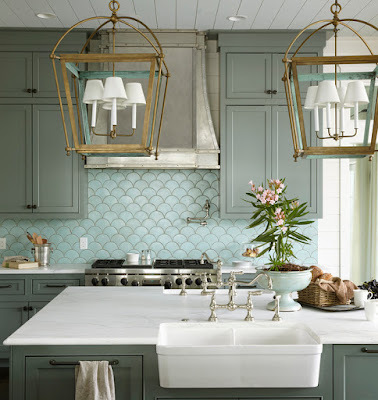 Backsplash: The backsplash is Tabarka Studio Artisan Terracotta Fan Tile in Robin’s Egg Blue installed upside down to create a fish scale effect. 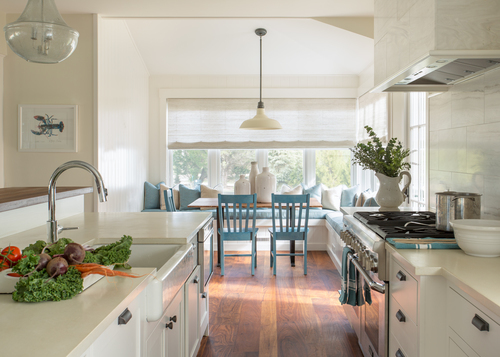 Sink: This island with white marble features twin Whitehouse Collection Fireclay Sinks facing each other. 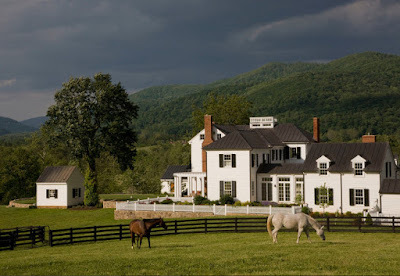 Designed by Gretchen Black from Nesting in the Bluegrass. 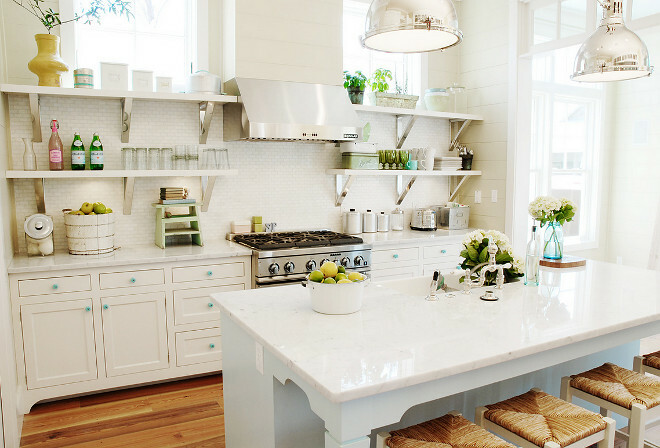 Open kitchen design with open shelves beside kitchen hood, ivory kitchen cabinets, turquoise blue hardware and mini-tile backsplash. 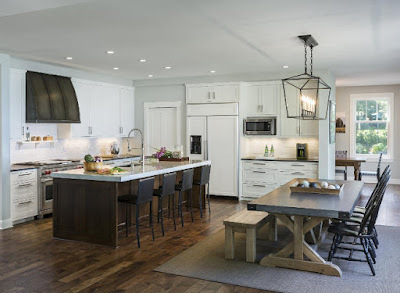 The kitchen island features white carrara mable countertop and industrial yoke pendants. Urban Grace Interiors. 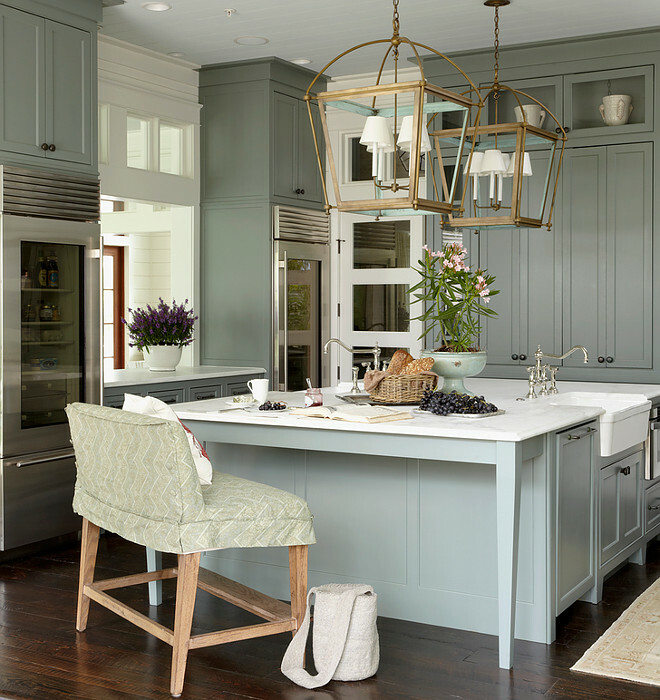 Kitchen island lighting is Basil Small Hanging Shades by Alexa Hampton in Polished Nickel. SIR Development. 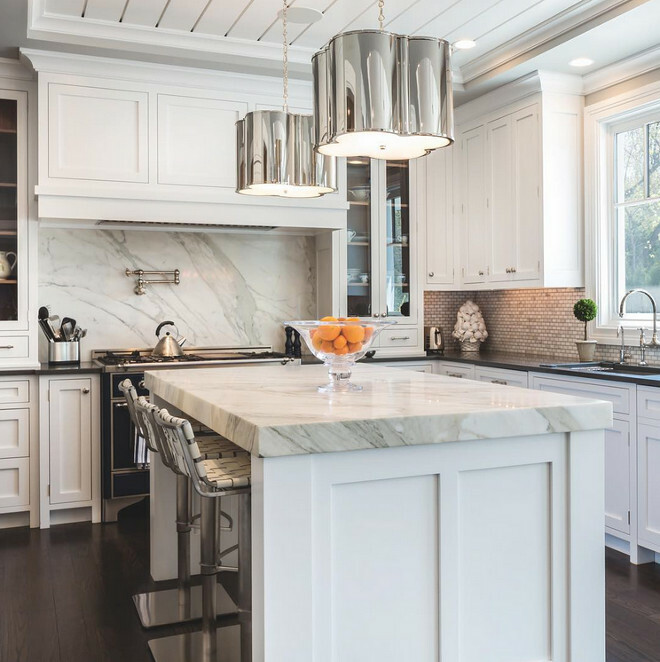 Kitchen features ivory cabinets paired with white marble countertops and backsplash. A black French kitchen hood stands over a swing arm pot filler and a stainless steel stove facing an ivory center island fitted with a sink and deck mount faucet illuminated by Osborne Lanterns. 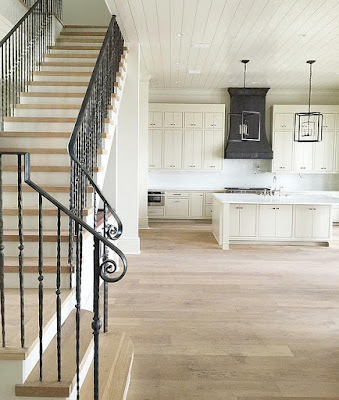 Floors are white oak with whitewash stain. 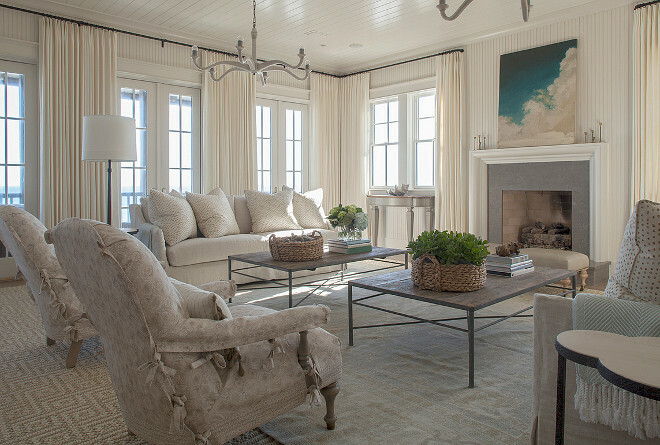 Urban Grace Interiors, Inc. This transitional kitchen opens to a dining room with Darlana Linear Chandelier and Restoration Hardware Zinc top dining table. The perimeter counters are honed Soap Stone (charcoal tones) and the island is Carrera Marble with a mitered 3.5″ edge. The hood was supplied by Raw Urth Designs. Cabinets are 2.5″ shaker cabinets. Floors are Big Wood 5” Hickory. Custom stained locally. Charlie & Co. Design, Ltd. 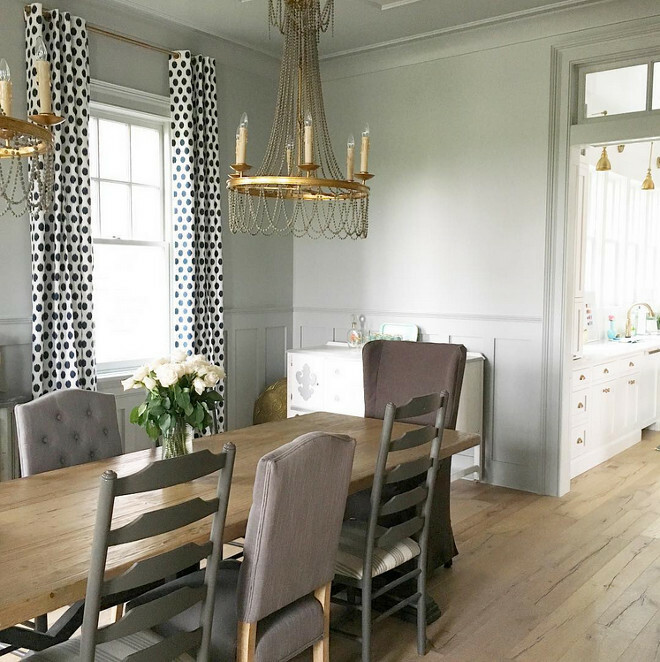 This open dining room features a beadboard ceiling accented with an antique brass Bryant Chandelier illuminating a round gray dining table lined with French square back dining chairs; Restoration Hardware Vintage French Square Fabric Side Chairs. Artwork is Jean Baptiste Geometrics Art. The kitchen boasts gray cabinets paired with gray granite countertops and backsplash. 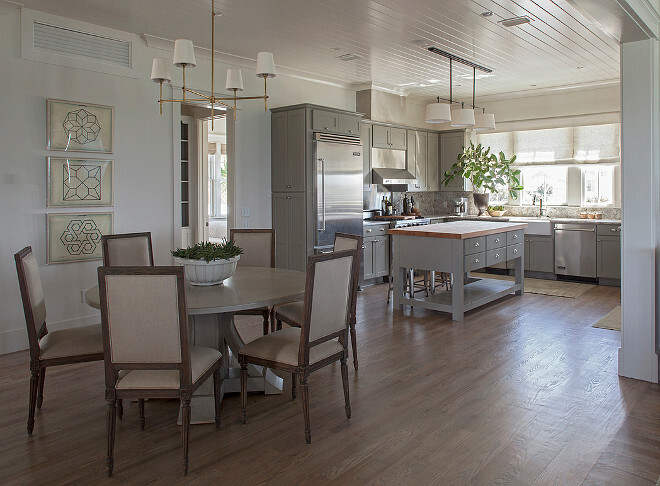 A 3 drum pendant, Bryant Small Billiard Light, hangs over a gray kitchen island topped with butcher block lined with Tolix Stools. Urban Grace Interiors. Dining room with full wall board and batten wainscoting, lit by Ruhlmann Single Sconces in Bronze. 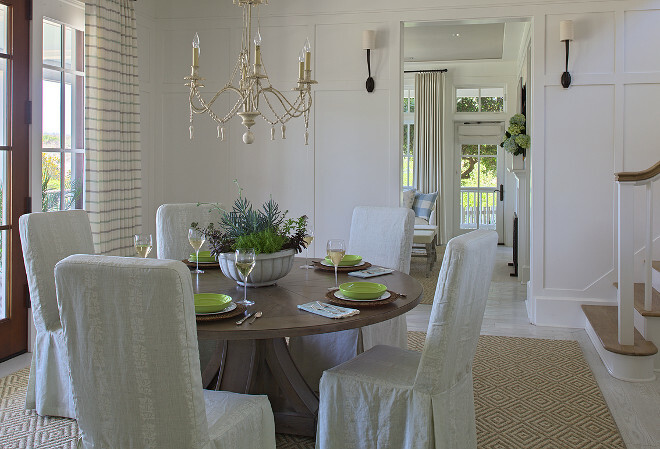 Neutral dining room painted in a creamy white paint color and white plates hung on the wall niche. Gray Paint Color: “Benjamin Moore HC-169 Coventry Gray”. Chandeliers are Castle Howard 6 Light Crystal Chandelier by Aidan Gray. 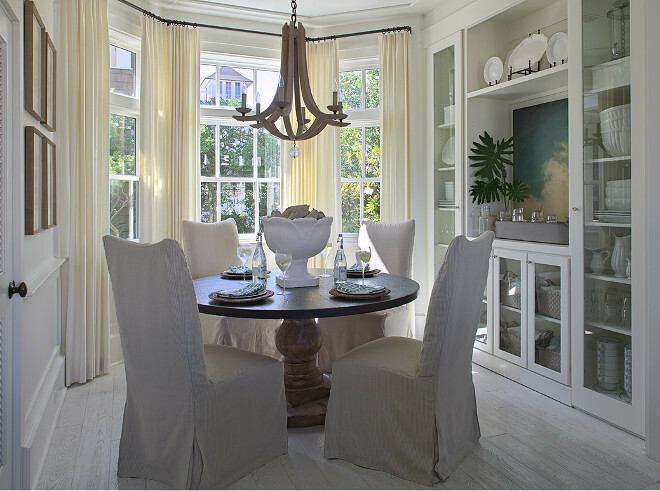 Beautiful cottage breakfast nook features bay windows dressed in cream curtains filled with round pedestal dining table lined with linen slipper dining chairs illuminated by an Arteriors Manning Chandelier atop white oak floors. 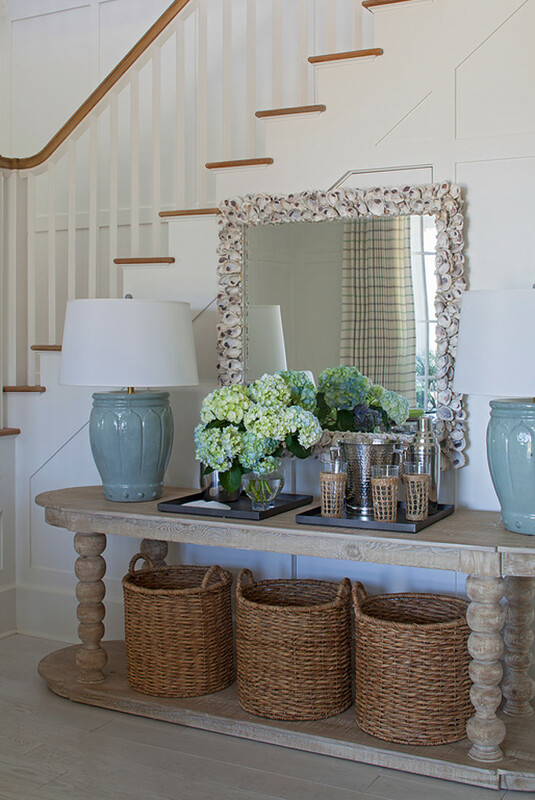 This coastal foyer features wainscoted staircase, an oval console table filled with three round woven baskets and topped with watery blue table lamps and a large rectangular seashell encrusted mirror. Best Warm White Paint Color by Benjamin Moore: “Benjamin Moore 925 Ivory White”. Benjamin Moore 925 Ivory White won’t look yellow or peachy on the walls. This octagonal lanterns, Morris Lantern, are unique and modern. Stone fireplace is Clarksville Blue/Brown RSR. Small home office/den with reclaimed plank wood ceiling, vertical shiplap wainscoting and built-in cabinetry. 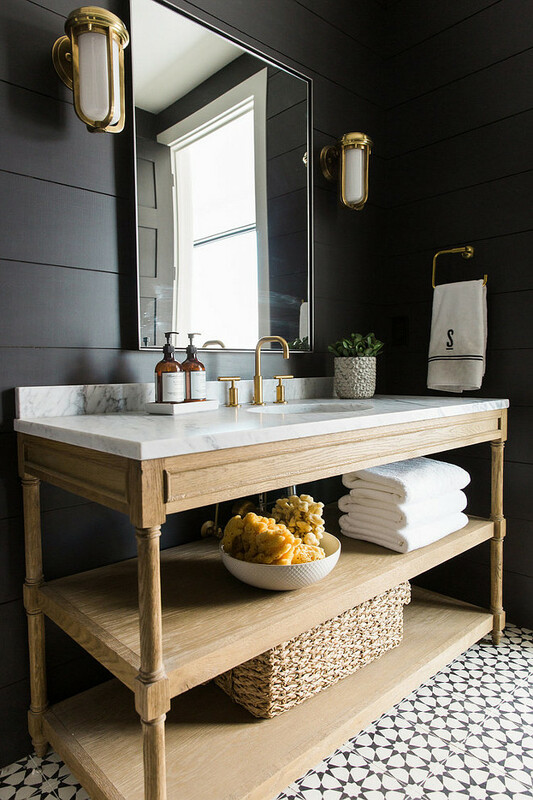 Draperies add some privacy to the space. 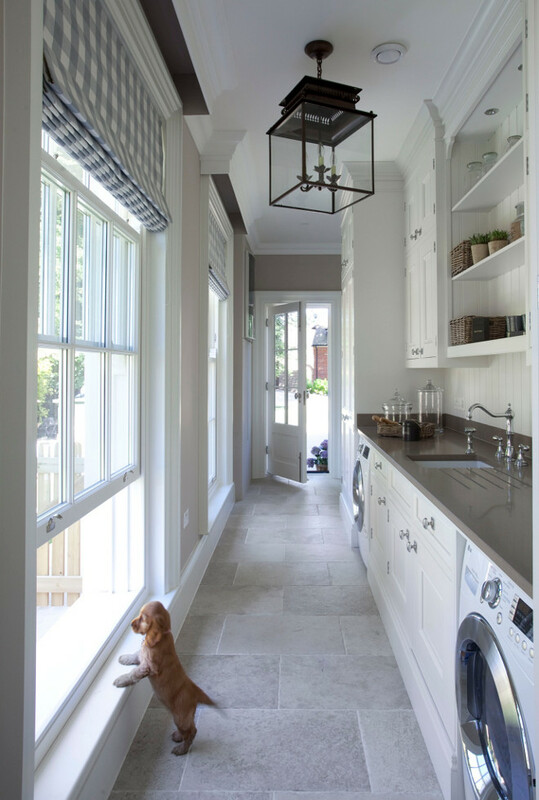 Great mudroom/laundry room design featuring quartz countertop and natural stone floor tiles. Lighting is Honore Lantern by Suzanne Kasler in Antique Zinc. 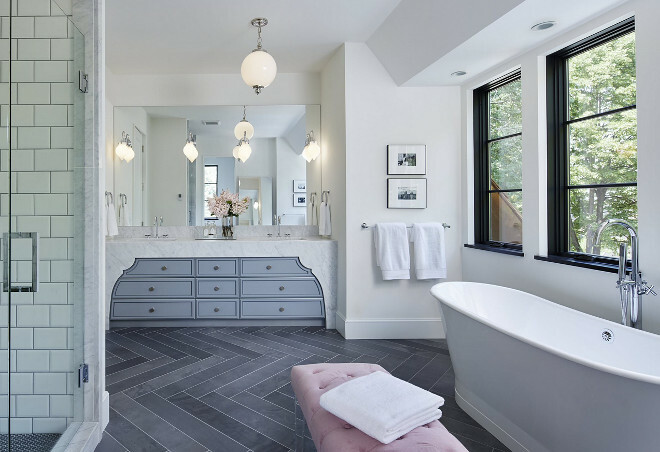 Bathroom with herringbone slate floor tiles. Black Benjamin Moore Paint Color: “Benjamin Moore Shoot”. 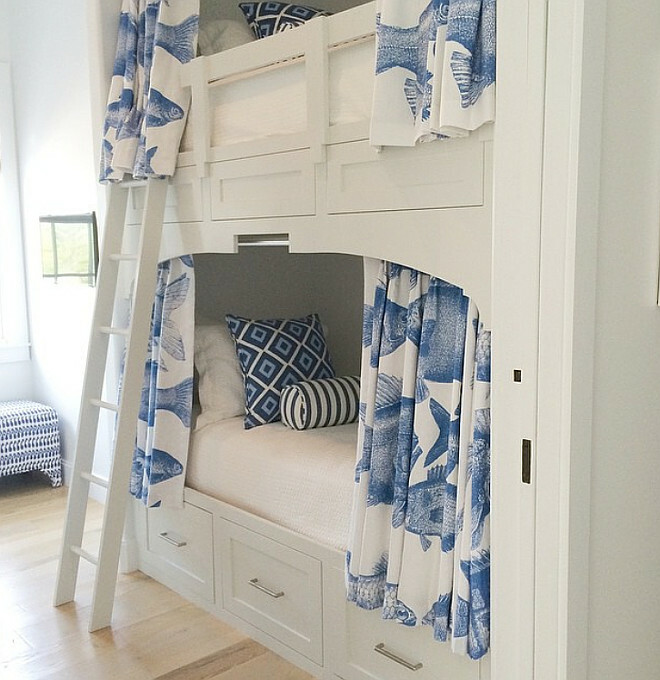 Bunk beds with curtains for added privacy. This chic small bedroom features a light gray wingback bed dressed in white and gray bedding as well as gray Greek key border pillows flanked by dark gray bamboo nightstands and Large Chunky Urn Table Lamps in Antique Burnished Brass. 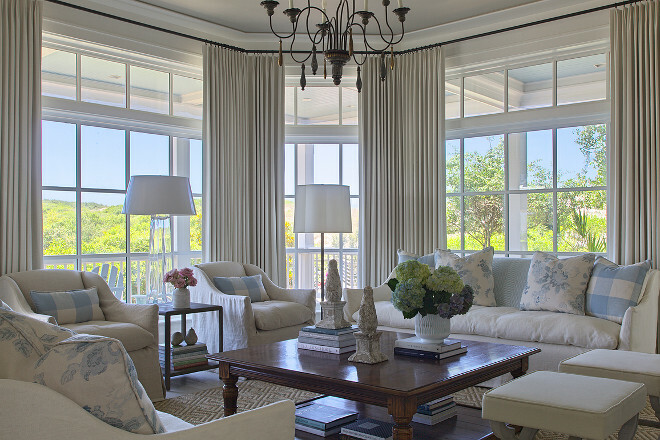 Windows are dressed in ivory curtains layered over bamboo roman shades. 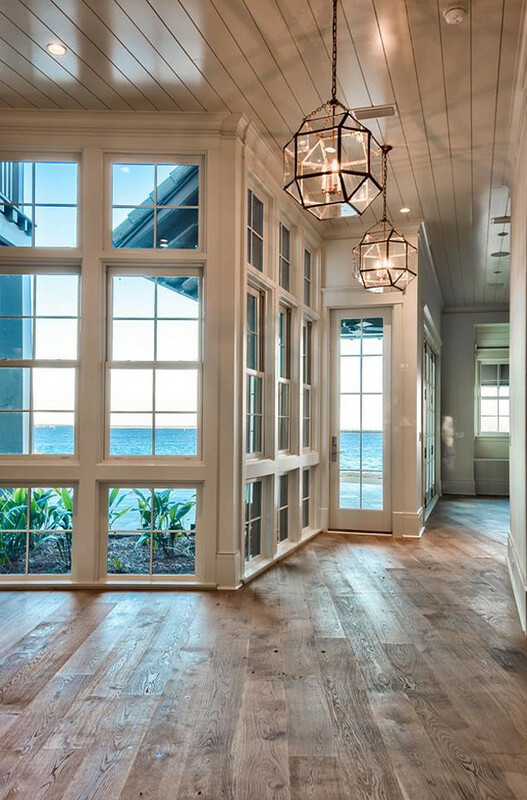 Master bedroom with floor-to-ceiling windows. 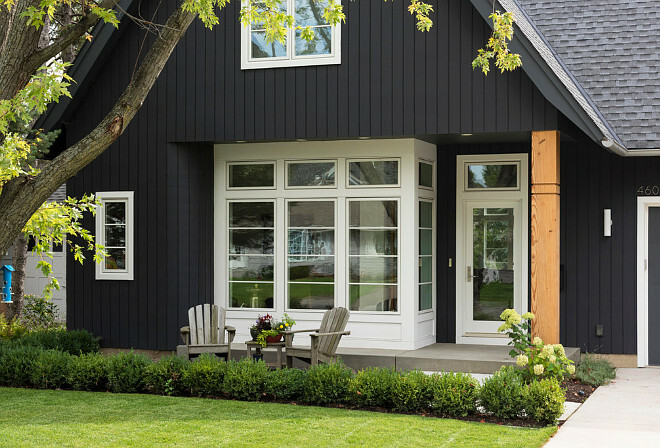 Dark exterior paint color ideas: The exterior paint color is “Benjamin Moore Black Jack 2133-20″. 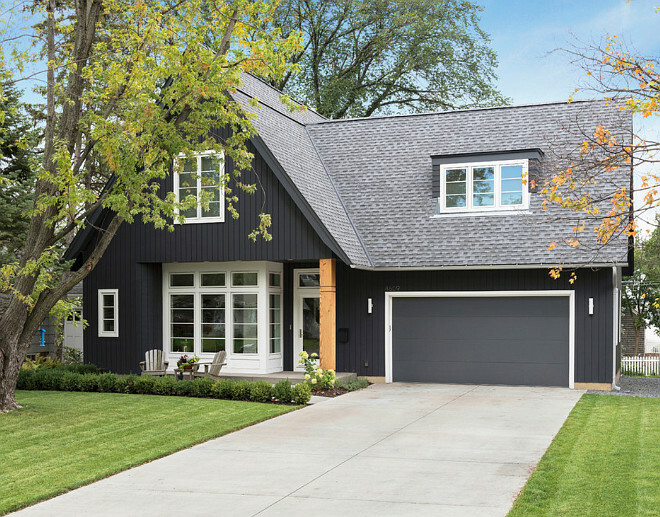 The garage door and dark trim is “Benjamin Moore French Beret 1610″. The white trim paint color is “Benjamin Moore Decorator’s White”. 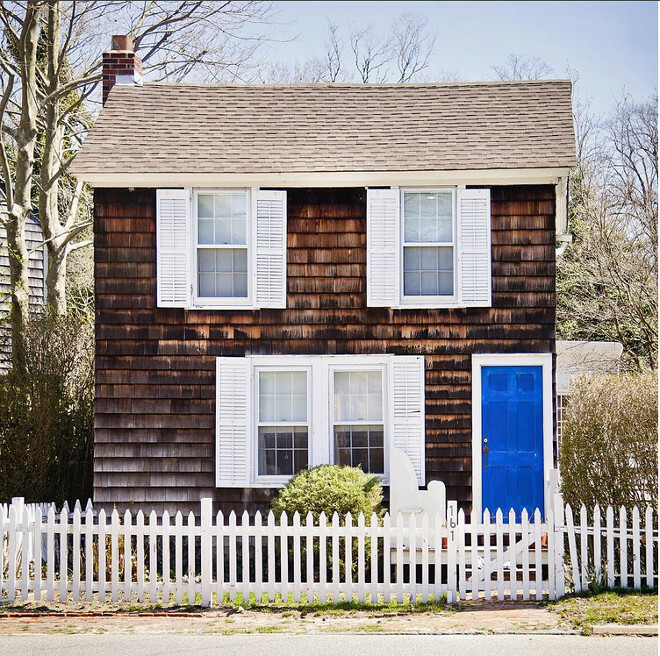 The farmhouse siding is painted in Benjamin Moore Simply White. Roof are #1 Blue Label 16″ CertiGrade machine sawn cedar shingles with a 5″ exposure. This farmhouse is approximately 4,200 sq ft finished. 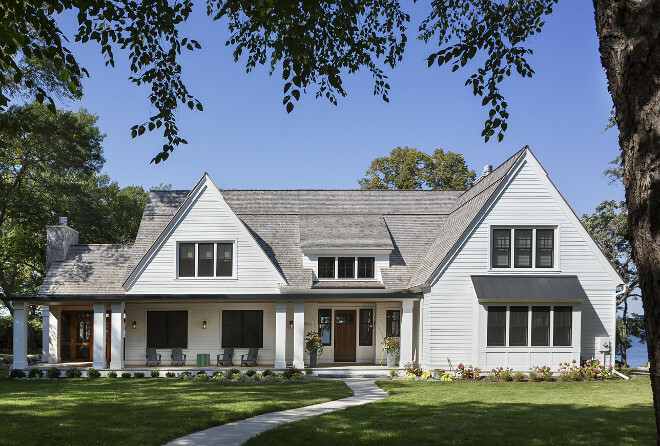 Sources: 1st Image: Mark P. Finlay Architects, AIA. Photo Credit: Durston Saylor. Remaining Sources: specified below each image. Nesting in the Bluegrass. Urban Grace Interiors. Savoie Architects. Charlie & Co. Design, Ltd. SIR Development. Hayburn & Co. Howie Guja. SURROUNDS Landscape Architecture + Construction. Clean Mama. 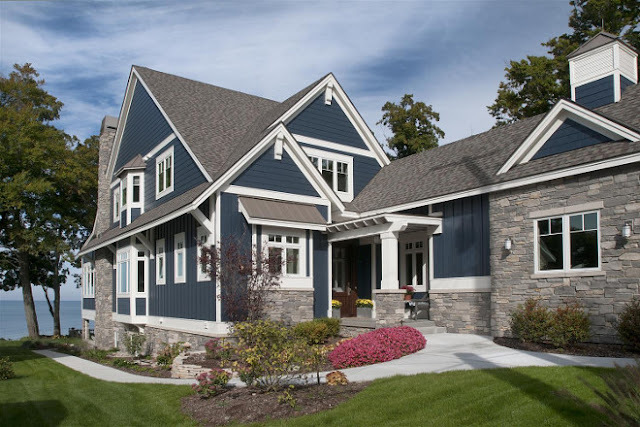 Artisan Signature Homes. Studio McGee.Bryn Alexandra.